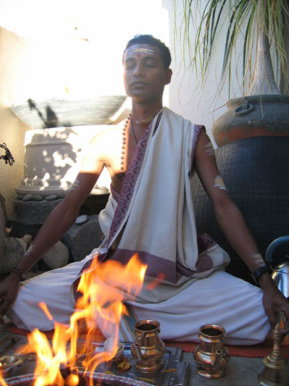 Herewith, a brief Introductory note about the Vedic Astrologer and Pujari Shiva Kumar. Shiva Kumar is a re-known astrologer and pujari from South India. He has been under the guiding light of several spiritual masters and has himself spent over 15 years as an ascetic. He has been awarded the special distinction title of Jotish Ratna in the field of Astrology and holds a master degree in Philosophy and Religion. As a traditional pujari he has been performing mass poojas across India where over 5000 people would attend each ceremony. He has travelled to many places across the world including Japan and America for Satsangs (group discussions, questions and answers about Knowledge), Astrology consultations and poojas (individual and mass poojas) helping people of all religions find remedies to their problems. Well versed in the Shastras and abiding by the strict dharma code of confidentiality as a professional astrologer, he provides at the same time the inspiring insight and the helping hand in the face of difficulties.